The first style of homes to be built in Vickery Place were the 2-story Prairie style homes--at least one per block were built and served as the model homes of the day. These are still the showcase homes of Vickery Place today. A few years later, blocks were in-filled with Craftsman bungalows. Even though these were much smaller 1 story homes, they were compatible with the neighboring Prairie homes because they shared a setback and were clad in wood with wide front porches. It is still the most predominant style of home found in Vickery Place. Tudor style homes came along in the 1920's and made a nice transition into the newly developed Greenland Hills neighborhood to our north, which was than and still is today made up of predominantly Tudor style homes. These three styles, Prairie, Craftsman and Tudor, make up 90% of the homes in the neighborhood and are included in the Vickery Place Conservation District. The conservation district allows new construction coming into the area to reflect one of these three styles. Each style incorporates certain criteria that is required, as well as a choice of certain optional features. The Craftsman Bungalow and the Prairie School House emerged simultaneously from the same Art & Crafts philosophy yet with two different forms and from two different regions. The Prairie School House emerged from Chicago and the American mid-west. Frank Lloyd Wright in the William Willett House of 1902 found a cohesive form that included all the aspects common to this new style. Wright's houses have a cross axial plan and center fireplace with a low pitched hipped roof with extended eaves. The rafter tails of the Craftsman bungalow are enclosed to create a more horizontal emphasis. Architectural elements that reinforced the horizontal line included belt courses in the brick or a continuous accent at the upper level window sill, a change in material on the upper section of the wall, and the extension of the house to include a porte cochere. The windows are large units installed in multiples, commonly three to five in a row. Mullions on the upper lite were common. The Chicago School Architects preferred the casement window. The hot humid climate of Texas resulted in the use of double hung windows. Brick is the dominant exterior material. Front columns are simple masonry columns without the half wooden box column of the Craftsman houses. Entry porches are broad and large, usually asymmetric to the front elevation. Sleeping porches became common elements. The best example of the Prairie School design, in Dallas, is 5501 Swiss Avenue. The best examples within Vickery Place are 5506, 5435 and 5458 Vickery, 5504 Willis, and simpler versions are 5235 and 5239 Goodwin. The Prairie School House continued the search for an American Architecture for the new century. Craftsman houses expressed a movement toward a simpler architecture following the excesses of "Queen Anne" Victorian design. The Craftsman style bungalow is based on the writings of Gustav Stickley and his magazine the "Craftsman" and the widely published work of Greene and Greene Architects in California. The credo of Stickley was to keep materials simple and unadorned. Typical houses are one story with gabled roofs, wide porches, extended overhangs, heavy wood brackets or corbels, masonry with wood box columns, and fireplaces located on an exterior wall. The majority of the houses from this period have multiple gables, in this neighborhood as many as five per roof. The rafter tails are exposed and occasionally with a "fancy cut" end. Front columns usually extend from the ground up, and brick is usually about half of the total height. The wood box column was assembled from standard mill trim that could be assembled by a carpenter on job-site. Houses from 1906 through 1920 are typically wood siding a three inch drop siding pattern. The houses on Willis and Richard are typical of the Craftsman Bungalow. During the twenties brick veneer emerged as the dominate material for the body of the house. Brick veneer craftsman houses are found in the 5100 and 5200 blocks of Vickery and Goodwin. The Craftsman Bungalow was the first American house of the twentieth century. This was the first housing type to deal with advent of the automobile, electricity, and the telephone. The primary intent was to extend home ownership to the average American. Romanticism has always been a recurring factor in American architecture. The romantic movements always found solace in architectural styles of the past. Tudor houses borrowed from the idealized images of rural England and the writings of Ruskin and were in contrast to the emerging technologies of the time, electricity, automobiles. The Tudor style existed concurrent and simultaneous to the Craftsman and Prairie School designs which were a response to the American ideals of simplicity and a belief in the power of the new technology. The Dallas version of the Tudor style was easily applied to single family, and multi-family houses. Typically exteriors are brick with stucco and stone trim. A unique quality to Dallas is the use of blond and light colored bricks. Most other cities used the more traditional dark tones. This is best represented by the two story duplexes scattered through out Vickery Place. Roofs are steeply pitched broken with multiple gables. The eaves are shallow and are flush with the gable are seldom more than ten inches. The fireplace is located so the chimney can be a highly articulated design element. The chimneys incorporated elaborate brick patterns. A common element is the asymmetric gable at the entry. Porches, an option, can have brick arches either round or two point tudor arches. Front doors are often turn sideways to the street. Street facing windows were arched double hung or leaded glass casements. The street windows are usually vertical and independent. 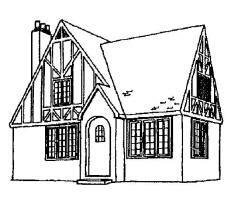 The best example of Tudor houses in Vickery Place are 2600 Madera, 5138 Miller, 5125 Vickery and 5310 Goodwin. The majority of Tudor houses are in the 5100 and 5200 blocks Goodwin, and the north side of 5100 Vickery. The two story duplexes in Vickery Place usually borrowed Tudor elements. Examples include 5552/54 Miller and 5601/5603 Goodwin. The Tudor house was a retreat to the imagined simplicity of another century, the Tudor style disappeared with Americas entrance in the war. The romantic ideals associated with the Tudor and Spanish Eclectic Styles was also produced the Colonial Revival Style. The 1876 Centennial Exposition fostered a renewed interest in the designs of the early republic. A time when Thomas Jefferson hoped to define an American Architecture loosely based on the architecture of the Roman Republic. Colonial Revivals have many sub-types and variants. Sub-types include Dutch Gambrel (5451 Morningside), Georgian, and the dominate version in Dallas based on southern colonial prototypes. The southern colonial variants usually are symmetric, with the focal emphasis placed on the front door. The porch is relatively small with slender turned wood columns, usually of the Roman Doric order, a style that was easily produced by the lumber mills of the 1900's. The roof is usually a side gabled roof, which reinforced the entry as the dominate design element. The eaves are shallow. Within Vickery Place the majority are wood siding, and the fireplace is place on the side of the house, never on the front. Windows are double hung and usually ganged. The houses built between 1915 and 1935 are more accurate recreations of the originals. Major magazines, such as American Architect and Building News, began a series of articles on the original designs and details. These were widely available and copied by architects and builders. The third romantic style of architecture found in Vickery Place is Mediterranean Style, which includes Spanish Eclectic, Monterey, and the Classical Italianate. The Spanish Eclectic Style began with the San Diego Panama-California Exposition of 1915. The style was extremely popular in the 1920's, the Highland Park City Hall and Highland Park Village are evidence of this. Lakewood is noted for it many Spanish Eclectic house, many by architect, Clyde Hutshell, Vickery Place has its own Hutshell at 5513 Bonita. It is typical of his style with blond matte brick. The roof is low pitch and shingled with red clay tiles. The eaves are shallow or non-existent. Usually there is one dominate front windows with all others inconspicuous. Another good example of the Italianate Style is the Bella Villa apartments at the comer of Miller and McMillian. It is a symmetric three story facade broken by belt courses. The exterior is stucco, and the roof appears to be a low-pitched hipped roof covered with red clay tile. The Italianate detail includes the heavy wooden brackets at the eaves that are arranged in a broken pattern. The doorway is the focal point with classically proportioned pilasters at each side, and a false iron balcony above. The Spanish Eclectic, Colonial Revival and Tudor house disappeared due to the material shortages during World War II. After the war the belief that America had entered a new age lead to several new style of architecture. Following the second World War, Following the immediate need was to house returning veterans and the baby boom that followed. After the war, vacant lots within Vickery Place were unfilled. The years immediately following the war were a time not of great design philosophy, like the Prairie School, but rather a time for experimentation with new building materials. Asbestos and asphalt shingles, steel windows, aluminum siding, concrete brick, and plywood, were the products of the redirected war industries. The goal was to build fast and cheap. American technology allowed builders within this time period to build an average house for ten dollars per square foot. The styles became minimal and sought to reflect a vision of the future. A classic example of this is the minimal traditional style it borrowed loosely from either Tudor or Neocolonial antecedents. Detailing, typical of the twenties, was omitted. There was usually a single gable facing the street, with a small rain sheltering porch, not the sitting porches of the twenties. The roof pitches were lowered to save construction dollars. Windows were single units, comer windows were also common. The best examples of the minimal traditional style, in Vickery Place, are 2607 and 2635 Madera, 5253 Richard, 5207 Miller, 5129 and 5143 Vickery. The other style typical of this period is the Ranch House. These are one story, with very low roofs and usually no gable. Overhangs are deep. They are generally two rooms deep and as many as four to five rooms in width. Windows are high and horizontal. The garage, or carport, is attached to the house. Vickery Place's version of the ranch house is 5133 Goodwin, 5133 Vickery, and 2611 Madera. The older style lot configuration of a narrow 50 foot front with great depth kept this from being as common as in the areas north of Northwest Highway and generally south of LBJ Freeway. The post war economic boom, the newly created Federal Housing Authority (FHA) and the Veterans' Administration (VA) loan programs, and the Interstate Freeway system, fostered the explosion of new suburbs. The new suburbs could offer larger houses, more bathrooms, and newer schools. Families moved to the new suburbs. The older inner city suburbs, such as Vickery Place were left to the elderly, or lower income families.